At Auction Event Solutions, we work very hard to stay on top of the latest industry trends. As part of developing our own "best practices," our team is constantly evaluating the latest fundraising techniques. Our goal is to identify the best strategies that will give your event the most successful results. Time is money. Online auctions expand your circle of supporters and increase fundraising revenue. Add to your base while maintaining interest and participation with existing constituents. Auction-TrackerTM and Auction Frogs applications facilitate easy flow of data between your event management software and online auction site. Auction-TrackerTM 6.00 features an integrated utility that pushes and pulls item and constituent-related data between online auction site and Auction-TrackerTM software. The latest development in auction management software and auction fundraising software is also the "green" solution. 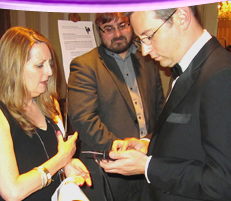 Electronic touch screens allow your guests to place bids instantly and easily — from wherever they happen to be sitting. A more exciting, competitive bidding atmosphere. Proven to raise more money than paper-based systems. Your guests go directly to item pick up — no more waiting in long lines. 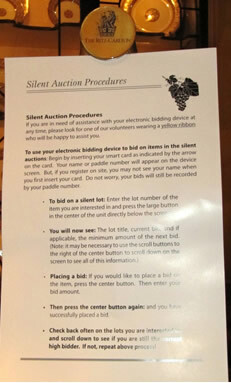 Streamlined item pick up enhances the auction night experience. Integrated, electronic payment processing saves you time in post-event reconciliation. Totals transmit easily and automatically between Auction-TrackerTM and credit card terminal. Should sales tax be charged on fair market value or the actual sale price during live and silent auctions for your tangible items? Auction TrackerTM v6.00 eliminates the guesswork. This software can automatically calculate sales tax on tangible items and produces the reports you’ll need for IRS compliance. 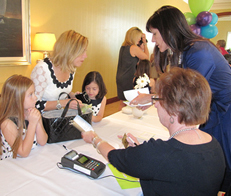 Successful live auction events depend on skilled auctioneers who will also entertain your guests. We've worked with some of the best in the country. No matter where your event takes place, we can refer you to an auctioneer who will become a valuable member of the team and maximize your charity event management and non-profit event management efforts. 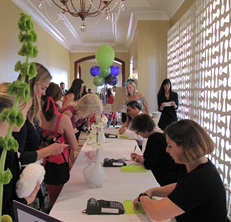 Contact Auction Event Solutions for more information about our auction clerking and charity event management solutions.